Fruit trees in Nebraska grow well in the hot climate of its spring and summer seasons. Nebraska's climate is a mixture of warm, humid summers and freezing cold winters in its continental regions and very hot and dry in the state's semi-arid regions. When selecting fruit trees in Nebraska, choose hardy varieties of fruit trees for your Nebraskan landscape. According to the Paul Hay, UNL Extension Educator of the University of Nebraska, apples grow well in eastern Nebraska; the varieties that do well in the Nebraskan climate are zestar, gala, jerseymac pristine and earlichief. Delicious and pristine apples demonstrate some resistance to cedar apple rust, a disease that easily affects apple trees throughout Nebraska. Apple trees ("Malus spp.") are members of the Rosaceae, or rose, family. These trees reach up to 30 feet in height, their purplish blossoms form in the springtime, and the apples appear on the tree from summer through fall. 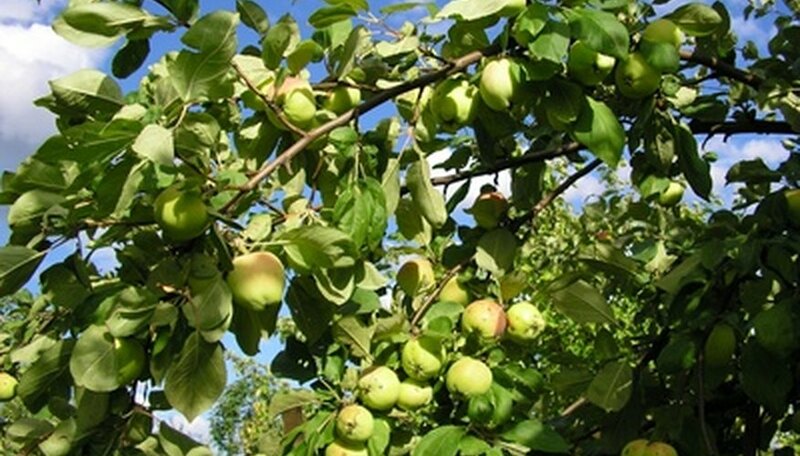 Apple trees grow in full sun and moist soil. The common pear ("Pyrus communis") is a member of the Rosaceae family. Pear trees grow in the spring and summertime, and their white pear blossoms form in early spring. Pears form and ripen in the summer. Pear trees require moist, well-drained soil and full sun. The University of Nebraska recommends varieties such as harrow sweet, magness and luscious for the Nebraskan climate. Cherry tree varieties grow from spring through summer, and their white flowers form in the springtime. Cherries are ready for picking in the summer. In Nebraska, cherry trees are often challenged by the cold season weather. The University of Nebraska suggests tart cherry varieties, including surefire and North Star. Plum varieties, such as American plum ("Prunus Americana") and chicasaw plum ("Prunius angustifolia") grow over 12 feet tall and are in bloom by mid-spring. Plums form and ripen in the summer and sometimes into the fall, depending on the variety. Plum trees require moist soil and full sun for optimal growth and fruit production results. Peach trees ("Prunus persica") grow up to 25 feet in height and require full sun and moist, well-drained soil conditions. According to the National Gardening Association, peach trees grow in zones 4 to 8 of the USDA's Plant Hardiness Zones, which includes Nebraska in zone 4b. The University of Nebraska suggests varieties such as Madison and red haven for Nebraskan gardens. Apricot trees ("Prunus armeniaca") are also members of the Rosaceae family. The National Gardening Association suggests that late-blooming apricot varieties be selected for northern climates, including Nebraska. The University of Nebraska suggests the harglow variety for its hardiness and increased fruit production.The best time to plant new apricot trees is in the spring, in a location that gets full sun exposure. The trees also need moist but well-drained soil to support its fruit production.